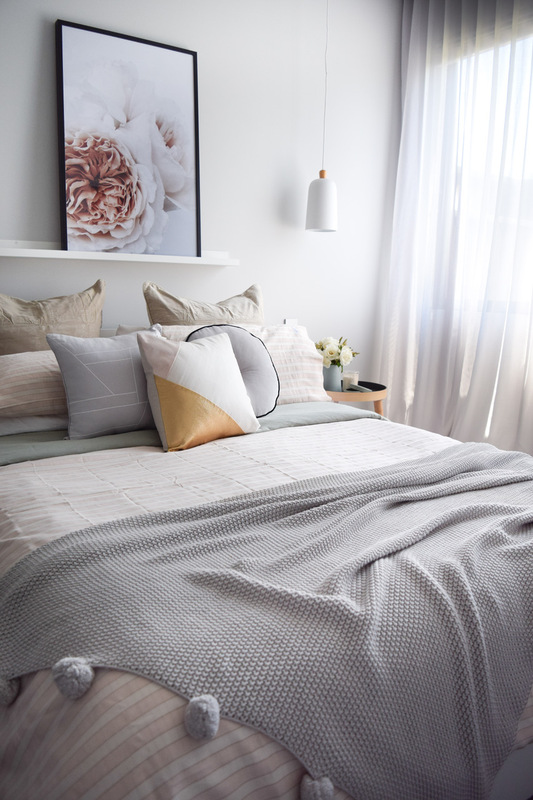 I am always on the lookout for new bedding and love to create a room styled around the bed. 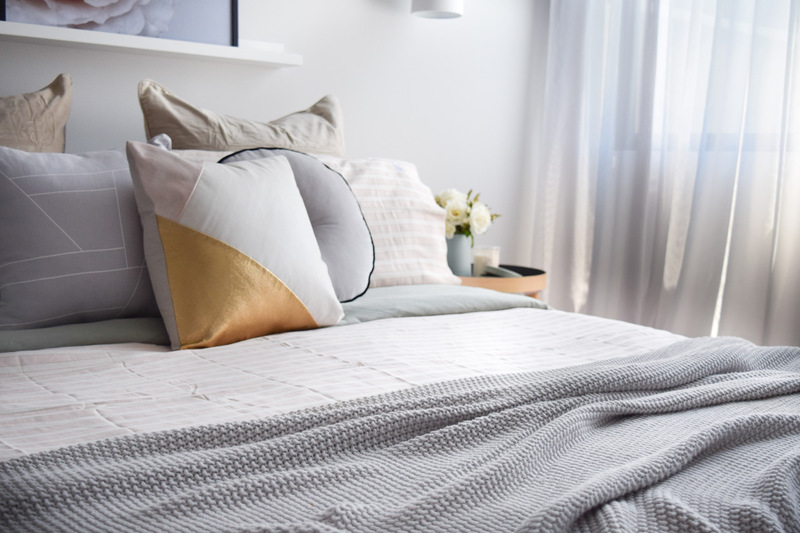 So when I was lucky enough to receive luxe new bedding from Siesta Home, I knew I’d have fun creating a soft blush pink and gold bedroom inspired by the sheet set. 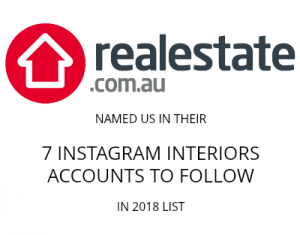 Siesta Home is the brainchild of former Olympic snowboarder Joh Lyle who wanted to combine her vibrant, colourful and adventurous spirit with her love of interior styling. Most of her reversible quilts feature bright and punchy colours, such as sherbet pink, but I went with the more muted tones of the ‘Retrospect‘ set which has a soft blush pink stripe and thin, almost gold pinstripes, and a reverse side of dusty sage. 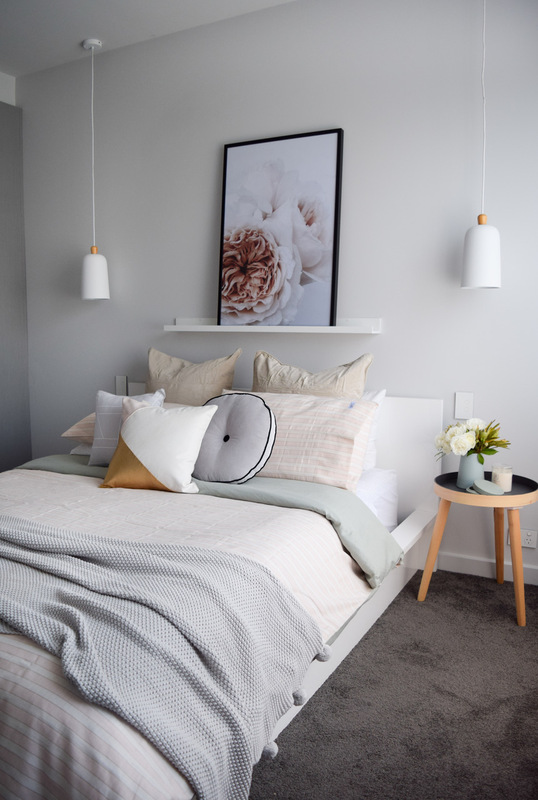 I paired this bedding with other cushions that pick up on the colour palette, an oversized floral photography artwork, and ceramic pieces in muted tones on the bedside table. Details of all the products and where to buy them can be found in the supplier list if you keep scrolling. If you don’t often style with colour or feel like you never get it quite right, it may be that the ratio is just off. Equal amounts of all colours in a space creates the sense as though they’re competing against each other. Instead, consider having 1 dominant colour, 1-2 secondary colours, 1 accent colour, and 1-2 neutrals. You can have more colours in the mix but this is a great rule of thumb for people starting out. In this bedroom, you’ll see blush pink was the dominant colour (making up around 60% of the room), gold was my secondary colour (around 30% of the bedding) and sage was my accent colour (around 10%). I also used neutrals of soft grey and white to break up the look. You’ve probably hard me say it before and I’ll say it again, styling in odd numbers just works! In this room I’ve used 3 feature cushions on the bed and 3 items on the bedside table. 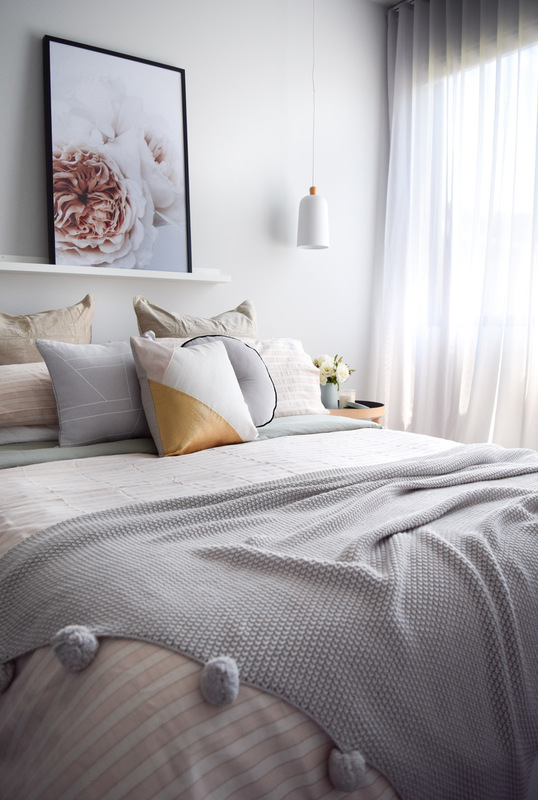 Try this trick of arranging items in odd numbers, especially the rule of 3, next time you decorate your bedroom. Another of my favourite tips is to mix higher end items with lower end pieces to create an overall look that’s stylish yet achievable. The bedding is the clear hero in this space and I always say investing in quality bedding is worth it. I’ve made savings elsewhere in the room by finding an inexpensive photography artwork, side table from Kmart and decor from other department stores like H&M and Adairs. The trick to mixing high and low is to ensure all the items fit the ‘brief’ or style you want to achieve, and to use products from a mix of stores so it doesn’t look like you’ve simply replicated the catalogue from an individual store. 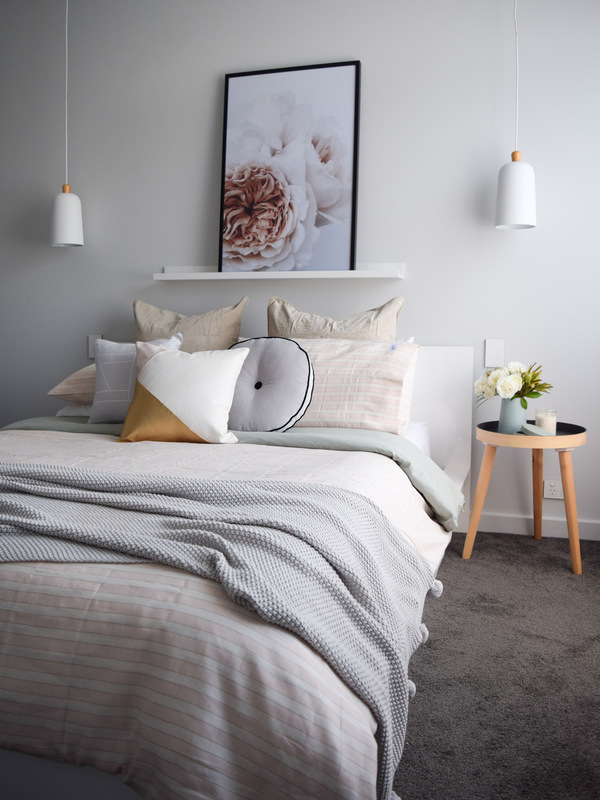 If you like the look of this bed, you may like to check out these tips to style your bed and these bedside table styling ideas.